Journalist Hilde Kate Lysiak is facing backlash after she reported a homicide in Selinsgrove, Pennsylvania, on Saturday afternoon – and beat all her competitors to it. But what really got the public riled up was the fact that Lysiak is just nine years old. On Saturday, the young reporter got a tip from a “good source” that a suspected murder had occurred on 9th Street, just a few blocks from her house. She then went straight to the scene to gather more information from neighbours and police officials. Pretty soon, Lysiak received a number of negative comments on her Facebook and YouTube pages from people criticizing her for reporting on violent crimes. Despite this, the young girl hit back at her critics with some strong words. “I know this makes some of you uncomfortable and I know some of you just want me to sit down and be quiet because I’m nine but if you want me to stop covering news then you get off your computer and do something about it,” she said in a YouTube video. “There, is that cute enough for you?” (Be sure to note the button she's wearing in the video. 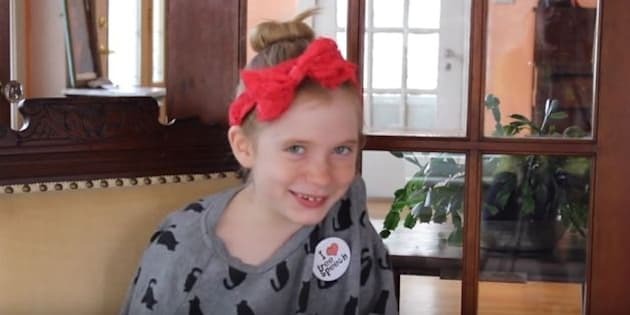 Lysiak started her website “Orange Street News” back in 2014, when she was seven, and has been reporting ever since. Her father, Matthew Lysiak, who is a former reporter for New York Daily News, inspired her love of journalism.